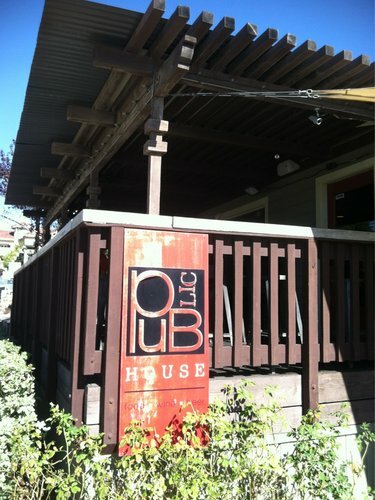 This time we visited Public House in Temecula, California. If you’ve never been to Temecula, you should go… right now. Not only do they have great wine and beautiful rolling hills, they are also a hub of major Paleo activity thanks in part to Temecula resident George Bryant of Civilized Caveman fame. I feel super lucky to live close to such a paleo-foodie town. We dropped by on a Friday night, so there was a little bit of a wait. No problem, we found a seat at the bar without too much trouble. 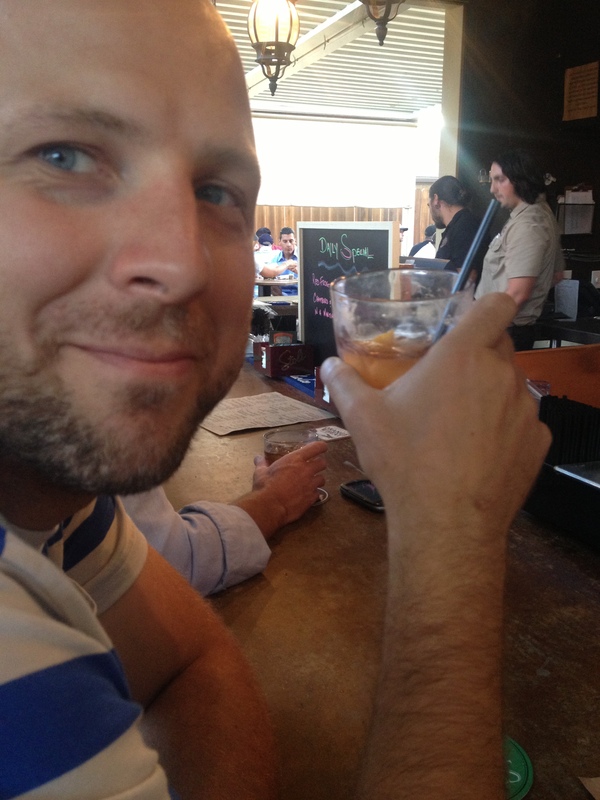 I ordered an Old Fashioned (read: whiskey drink – not paleo). It was just meh. 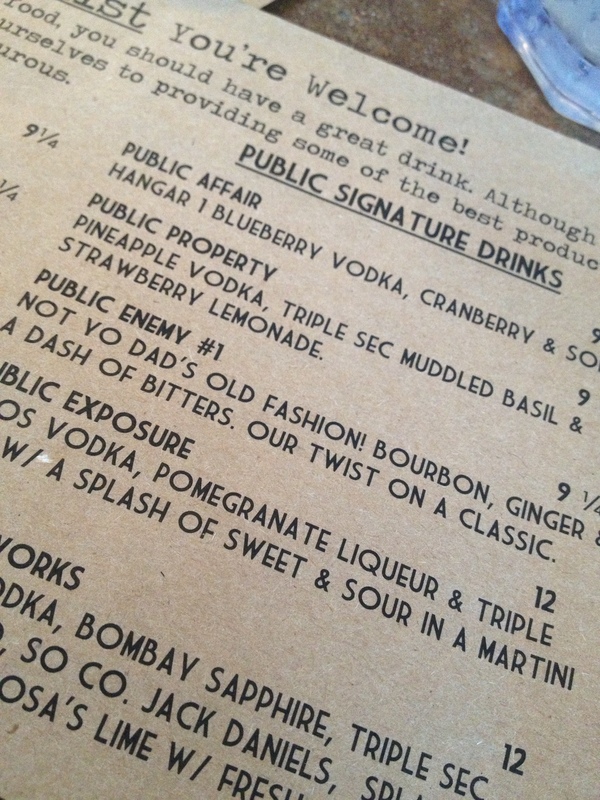 But I’m a little biased because I had the best old-fashioned ever at Death and Co. in NYC. This one was not even close to that, but then again, few drinks ever are. However, the bartenders were extremely nice and even gave the extras from a drink that they made for someone else. This is a side note, but one of the mark of a good bar is that the owners don’t make the barkeeps ration out the alcohol out of one of those stupid metal measuring cups. Seriously, do you know how much money a restaurant makes on booze? The markup on that stuff is crazy. You don’t need to treat it like it’s liquid gold. Seriously. I hadn’t even finished my drink yet when we were shown to our table by the hostess. Our server greeted us warmly. When we mentioned that Nik was gluten-free she didn’t roll her eyes and was quite helpful. Kudos. Seriously, she went through the entire menu telling me how to make certain dishes gluten-free and dairy-free, she even double checked with the chef about certain substitutions and options. She didn’t even make me feel like I was inconveniencing them in the least. Kudos indeed. To kick things off, I ordered a Cilantro jalapeño Caesar salad. This consisted of romaine, parm, bread, and dressing. A “small” salad at Public House equals super huge. Can’t imagine what a full salad would be like. This was an ever-so-slight twist on a Caesar. Yes, I could kind of taste the jalapeño if I flexed my imagination hard enough. But for the life of me, I couldn’t detect any cilantro. Basically, this was just a normal Caesar with a Mexican-sounding name. A yummy Caesar, but fairly run of the mill. Next. Unlike my salad (which was a bit one-dimensional), this dish was full of wonderful complimentary flavors that kept me loading up my fork until every bite was gone. 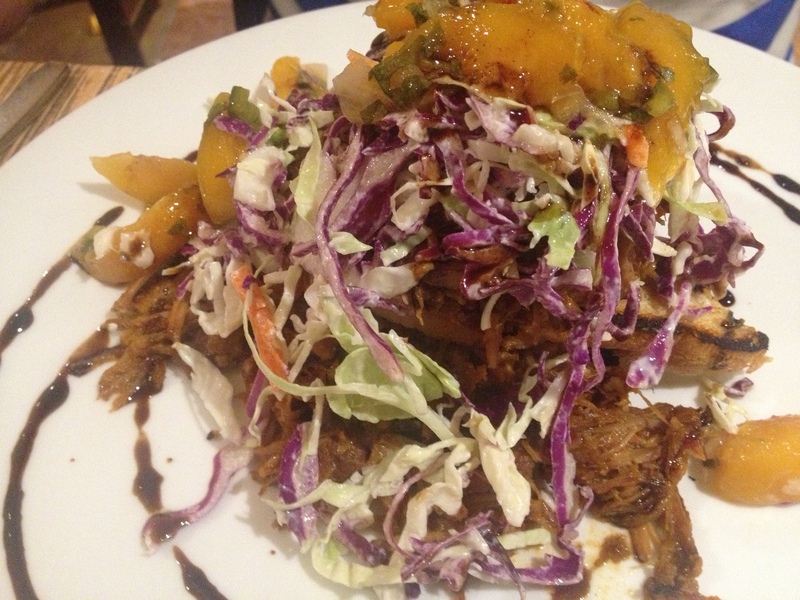 The sweetness of the peach slaw seemed to perfectly balance out the slight kick of the pulled pork. Like an elegant dance between dark and light flavors across my taste buds. (Or something.) No joke, he ate every bite and had this child-like grin on his face the whole time. My bun-less kobe burger was amazing as expected. This simple facts are; It was juicy. It had bacon. The tomatoes were fresh and yummy. An all-around great burger. 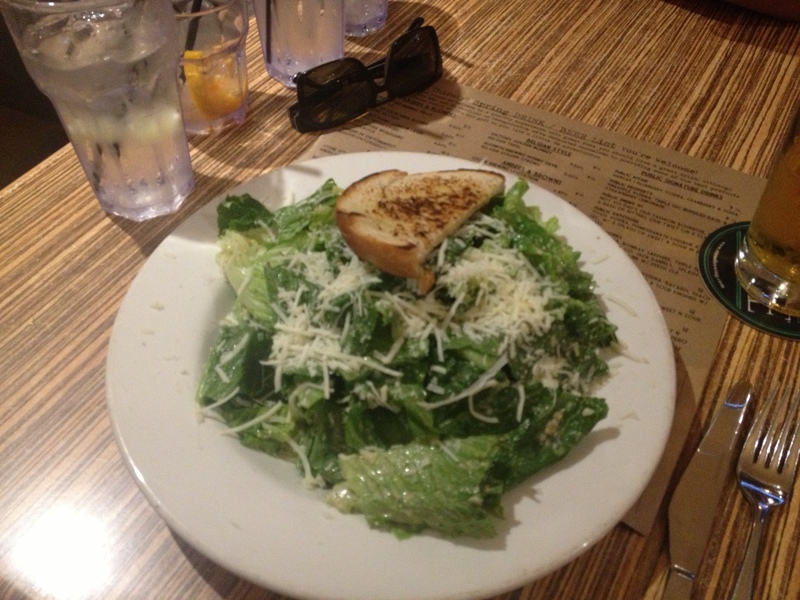 The salad had a light sweet and citrus-y flavor that complemented the richness of the burger. 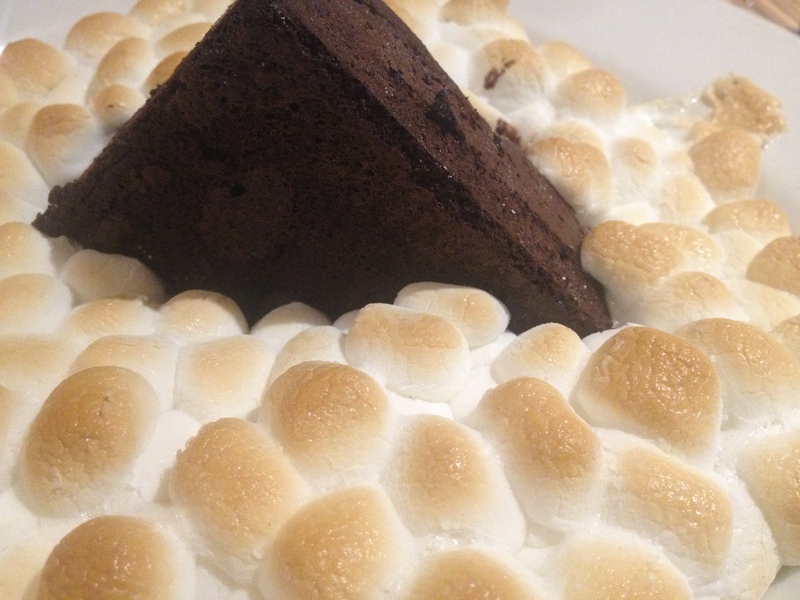 Lastly, we indulged in their flour-less chocolate s’mores dessert. The server was kind enough to inform us that we could leave the graham crumbles off for a completely GF experience. So we went for it. The cake was pretty decadent. I mean, just look at it! It’s basically a chocolate mountain surrounded by lightly toasted marshmallow clouds. When I first tried the cake, I found it a bit dry, but as i began to eat my way to the interior, I found the moistness I was looking for. It’s fair to say that Geoff and I were pretty satisfied by this meal. Ambiance: Outside was great, inside was a little uninspired. Allergy-Friendly: For sure, you’ll just have to put on your big-girl (or big-boy) pants and make your needs known to the staff. *Side-note: this is a sterling review given that we were seated next to a big family party with children who were probably close cousins of the Animaniacs. Just sayin.